With PropertyPhotos data management and our HealthCheck™ service, you can streamline your marketing efforts with centralized secure storage, hosting, and analysis of your photographs, lifestyle videos, virtual tours, and 2D/3D floorplans. 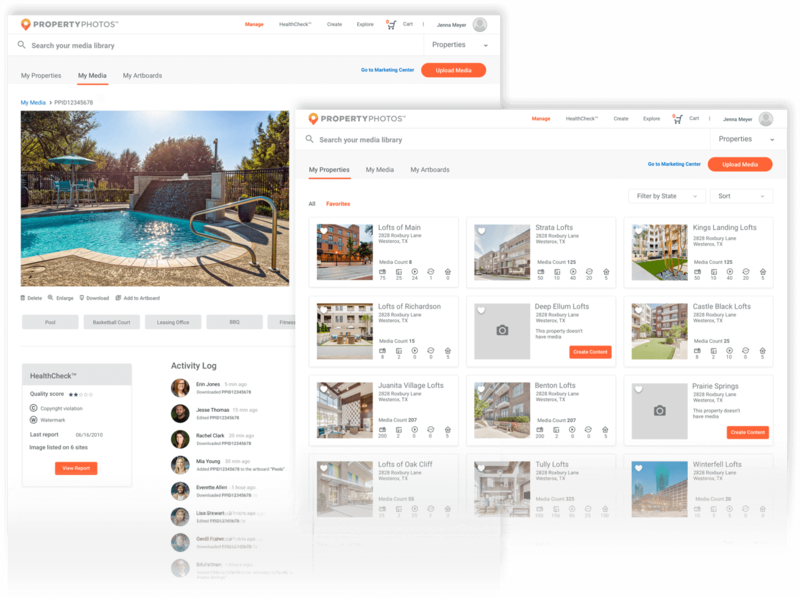 Manage files from your PropertyPhotos dashboard, review your comprehensive media analysis, and receive clear and actionable recommendations to improve your visual assets and elevate your community’s visibility online. Maintain all your portfolio’s assets in one convenient location. Our centralized, secure storage hosts all your PropertyPhotos content—photographs, lifestyle videos, virtual tours, and 2D/3D floorplans. Quickly locate and download high-resolution content for brochures and print ads or share directly online through any and all social media channels. Never lose a file again. Our smart categorization system automatically organizes your media for better, quicker file management. Thousands of housing providers all over the country trust us with their data. We’re the fifth-largest SAS hosting center in the world with a whopping six petabytes of data. Marketing Center allows you to quickly and easily syndicate content across all marketing channels, including your website, ILSs, classified posting sites, and social media. We’re taking the management out of file management through machine learning and are automatically keywording your photos and floorplans with industry specific terminology. Want to understand how the media you’re sharing online affects your online visibility and ties into your overall marketing strategy? The PropertyPhotos HealthCheck™ performs a detailed analysis of your content, delivering clear and actionable recommendations to improve your visual assets. A comprehensive report provides unprecedented visibility into your media's quality rating, displays the online locations of your images, and offers expert guidance on how to capture more leads through your visual content. Learn how your images rank in quality, giving you the opportunity to replace outdated or low-quality assets and ensure you have the most engaging content in today’s crowded market. Understand where and how your content is being used and seen online, so you can take action against less effective media and make sure the right content is showing in the right places. Avoid copyright liability. Our HealthCheck™ scans the photo for any watermarks and copyrights and presents the information for you to take quick action.